Fans roared outside as another SUV or limo opened up and A-list celebrities stepped out to a rain-soaked crowd on the red carpet. It is award season but this was a different kind of prize they were nominated for. It wasn’t for their work in a film or TV show but rather over the course of a season. Most were NFL players, coaches and executives who made their way inside Phoenix Symphony Hall for the fourth NFL Honors, which had a particular local taste in 2015. 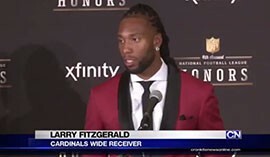 Kurt Warner did not make the 2015 Pro Football Hall of Fame class but Arizona Cardinals Coach Bruce Arians and wide receiver Larry Fitzgerald went home with hardware. He led the Cardinals to an 11-5 record and the No. 5 seed in the NFC playoffs. Although he was elated to receive the award, he was disappointed the Cardinals didn’t make it to the Super Bowl in their home stadium. Fitzgerald received the inaugural Art Rooney Award, given to the player who demonstrates the best on-field sportsmanship. He didn’t think he did anything special to deserve the award. It’s just in his blood. The award had special meaning for Fitzgerald. Rooney, the award’s namesake, founded the Pittsburgh Steelers in 1933. Fitzgerald attended the University of Pittsburgh in 2002 and 2003 and had his No. 1 jersey retired in 2013. He was a unanimous All-American and Biletnikoff Award winner his sophomore year. Now seven years removed from that Super Bowl, Fitzgerald caught 63 passes for 784 yards and two touchdowns this season. He has caught 909 passes for 12,151 yards and 81 touchdowns in his career. Warner’s failure to make the Hall of Fame bitterly disappointed his former teammate. 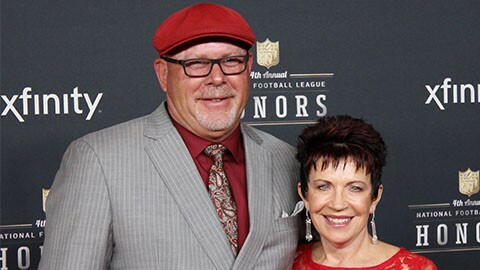 The NFL Honors happened Saturday night in Phoenix. They had a local flair, given two Cardinals, Larry Fitzgerald and Bruce Arians, both won awards. What did they have to say about their victories and why was each award special to both men? 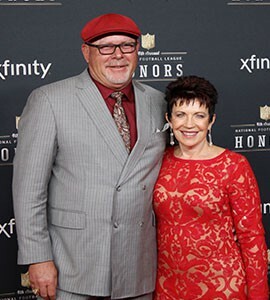 Donning one of his signature hats, Arizona Cardinals head coach Bruce Arians smiles with his wife, Christine, before winning AP Coach of the Year during the 4th Annual NFL Honors.